Returning to von Moltke, he was surely exaggerating to make a point. Plans certainly need wiggle room, but not all plans fall to pieces the moment the enemy bestirs himself. Just about every key facet of Case Yellow worked like a charm as the French and British armies, irrespective of what they were rubbing up against, witlessly obliged in executing their own downfall by doing pretty much what the likes on von Manstein believed they would do. Likewise, at Cannae, Hannibal annihilated a massive Roman army which again did almost exactly what the great general envisaged them doing. But never mind what the enemy is doing, what about the forces, or more particularly, the subordinate commanders, who are supposed to be carrying out the agreed strategy once the shooting has started? 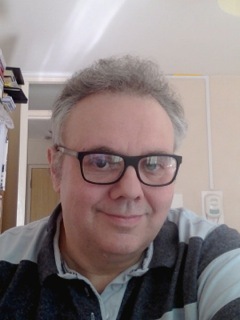 And what about those factors which do not appear in written plans and pre-battle orations – the weather, disease, good and bad omens and the like. It was certainly not part of the British plans at Mons, that, at some pre-arranged moment, everyone from King Arthur to the archangel Gabriel appeared in the sky and inspired the thin khaki line to hold off the grey hordes; but nevertheless many a Tommy claimed to have seen them. And whatever nasty surprises awaited Hitler as untold masses of tanks crawled out of the Russian forests, the real unraveling of Barbarossa had rather more to do with bad weather, useless and late arriving winter clothing, and Hitler himself falling ill at the end of the summer which left his generals free not so much to tinker but to revise wholesale what Hitler had wanted to do. In short, all plans have a weak point, and the key then becomes to ensure that the enemy, neither by accident or design, ever gets near hitting the vulnerable spot. Wellington kept his vulnerable spots hidden in that tangle of make-do and mend, which meant that any given point was never the vulnerable point; but for Napoleon the weak point could often be Napoleon himself. Whilst Napoleon was still on top of his game, and consistently so, his risks, gambles, “catch me if you can” manoeuvres, and everything that went with them, could be counted on to win the day. But, even relatively early on, the fine workings of Napoleon’s very fine harness could be thrown into hazard. His plans for another Cannae at Eylau were thrown out by the blizzard his army fought in, which confused his army’s movements, delayed his reinforcements, afforded his artillery precious little it could see let alone fire at, and brought him a dubious victory at a very bloody cost. But the campaign that really showed up the shortcomings of Napoleon’s military genius was the 1812 foray into Russia. There are many ways this massive ruin of a venture might be depicted, but it is tempting to portray it from Napoleon’s perspective as a highly experienced (but getting on a bit) team sports coach, who is trying to lead his boys through a season fought in everything from blazing heat to freezing cold, on fields which are rutted and worn, with facilities that are virtually non existent, and a sideline which is a hundred yards away from the action. And adding to the sense of frustration is the fact that the coach “Pop Bonaparte,” just played the game in his day at a level far higher than any of the players out there are capable of, and thus he is just dying to get out on the field, tell them what to do up close, and then, if they still cannot do it, hang out there and do it himself. In campaign after campaign prior to 1812, Napoleon’s grand scheme of things had been assisted by the fact that he was rarely more than a day’s ride away from any corps headquarters, and thus he could influence events and do the coaching knowing his influence would be felt and acted upon. But in Russia it was all so very different: envelopments were supposed to coordinated and carried out at distances far remote from the headquarters of the emperor; dispatches sent and dispatches received were badly out of date by the time they were written, let alone by the time they actually reached their intended recipient; and with those subordinates the emperor was grudgingly relying upon being comfortably away from any sight of the imperial clipboard being thrown down and the eruption that would go with it, things just never moved with the speed hoped for…and could not anyway, on the sand and mud bath the supposedly fleet formations of the Grande Armée were meant to do their stuff on in Tsarist Russia. Add to that the emperor’s own travails of weariness and disillusionment as his carefully planned campaign led to frustration after frustration, and add then the bad cold which led to bad tactics at Borodino, and you have the answer why this Russian nightmare just went from bad to worse. And then, after further frustrations and eventual defeat in the massive campaign of 1813 in Germany, it was very different in 1814. Napoleon’s situation was simplified by his having very little army left, and the front being reduced to comfortable distances. As a result he was once again capable of throwing his forces here, there and everywhere, moving faster with his far less cumbersome order of battle than he had for many a year. That he was again eventually militarily defeated was simply due to the enemy wisely opting to fight where he was not, and finally bringing their far superior numbers to bear. But if he had quit the inferno of Leipzig just a bit earlier, and had thus had a bit more army left to fight the following spring, it might have been a different story. It is hard to know, or rather even to guess, just how many accounts have been written of Waterloo and the campaign of The Hundred Days since those faraway hours of June 1815, but it is safe to assume that scores of different factors have featured in scores of different accounts as to what happened, especially through the 15th to the 18th June in southern and central Belgium. But whatever different accounts choose to highlight here and there with regard to the course of the campaign, there is little doubt in my mind that everything from Napoleon’s recurring lethargy to the erratic performance of subordinates can be encapsulated by the embracing factor of a total loss of time, both by the emperor and those he was chiefly relying on. This might not have been so much of an issue if either the French plan or the capability of the French army had been less susceptible to hiccups in the clockwork. But this was precisely where the plan was vulnerable, and the one man who could and should have foreseen this and acted with diligence to ensure the worst did not happen, was yet again off his game. There were actually two clocks running against Napoleon by the time he moved into Belgium. The first had started running the moment he was back in France after his exile on the island of Elba. This was the Coalition clock – the Coalition that had swiftly re-formed as news of his return reached their Vienna conclaves. 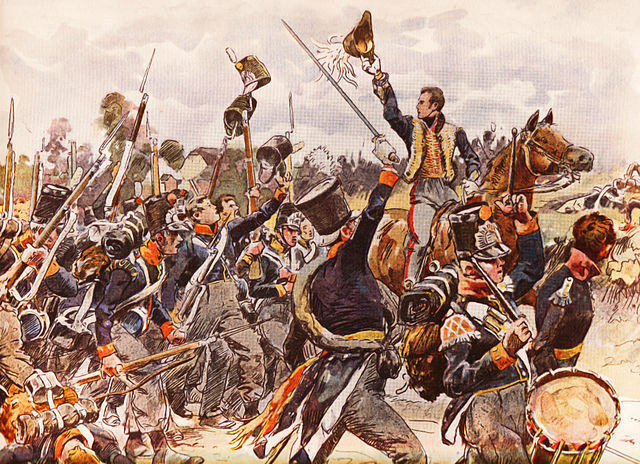 The Russians and the Austrians were again readying their massive field armies; the British were moving their fleet, and their fleet was moving a new army to Belgium, where it joined another sizeable force of Prussians under Blücher. By common consensus, Napoleon could not sit idly by and let this huge assemblage of hostile contingents march on his borders; for it was only a matter of time, of waiting for the clock chimes, before those forces did exactly that. So, after some lackluster attempts at negotiating a peace utterly failed, Napoleon was committed to a pre-emptive strike. The second clock was the campaign clock, linked to his overall plan for a move into Belgium and the defeat in detail of the two Coalition armies deployed there. There were several reasons why Napoleon chose Belgium for this initial fight – it was close by and thus, whilst keeping him near France, offered the prospect of a quick series of fights leading to a quick and telling victory; it also would pitch him against the two smallest armies in the Coalition – Wellington’s force of British, Dutch-Belgian, and contingents from the German states numbered a shade under 100,00; Blucher’s Prussian army numbered about 115,000. Both were therefore a little smaller individually than Napoleon’s Armée du Nord, but were likely to prove too much if they were able to join. However, joining was not much of a priority for either Coalition commander in Belgium, with Wellington fretfully mindful of his communications back to Britain via the Channel ports, and Blücher equally mindful of his communications back across the Rhine. Thus the two armies were pulled apart by their competing priorities, and this invited Napoleon to exploit the situation by adopting a campaign plan of the central position, whereby his army would interpose itself like a wedge between its two foes, block one from assisting the other, and then employ the greater part of its strength to defeat whichever one of the Coalition forces offered battle first. And with that matter successfully concluded, the other Coalition force could be engaged whilst the defeated army was harried and ushered away from any prospect of intervention and/or recovery by a smaller pursuing force. This was the sort of plan one could readily envisage the Napoleon of 1805 or 1806 being able to push through to complete victory – but it was, perforce, a high energy beast of a plan, which had to be lashed along to ensure that two sizeable opposing forces were kept off balance, and that the initial move put the French army well and truly between Wellington and Blücher. Given the relatively short distances, this was almost certainly going to be a quick and intense campaign, and for Napoleon, alongside the other benefits of victory was the prospect of bringing the Belgians and the Dutch back into the fold – peoples who had fought alongside the French not so very long ago, and whose allegiance to the Coalition was thought to be seriously suspect. So there was much to benefit the emperor by winning big in Belgium; but it was not 1805/6, it was 1815, and things were different. The plan was fine, but even before its first operational moment came, the emperor was eating away at its chances of success. To return to the earlier sporting analogy, Napoleon may well have been closer to the sidelines in 1815 than in 1812, but through his increasing want of tactical finesse he had taken half the plays out of the playbook, had compounded this by not putting his best team on the field, and seemed for prolonged periods totally reluctant to offer any direct guidance as to how anything should go. With a little coaxing, Murat would have been available to command the cavalry…but Napoleon did not summon him from Italy, and thus deprived himself of the best cavalry commander in Europe. 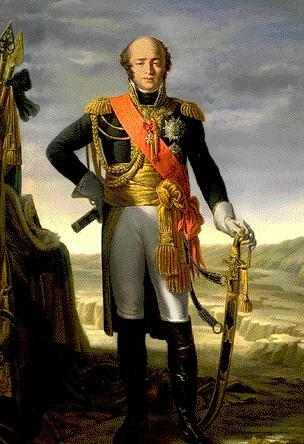 Davout was also available, and was head and shoulders above anyone else Napoleon could have appointed to a wing or corps command, but Davout was kept in Paris as a reflection of the emperor’s insecurities about his volatile political situation, and so Napoleon’s army was also absent one of the best field commanders of the era. So, having deliberately deprived himself of two commanders who knew how to move quickly and with telling effect, Napoleon made his advance into Belgium on June 15th 1815, accompanied by an army of relatively high but dangerously brittle morale, and caught up with at the last moment by the blustering Marshal Ney. 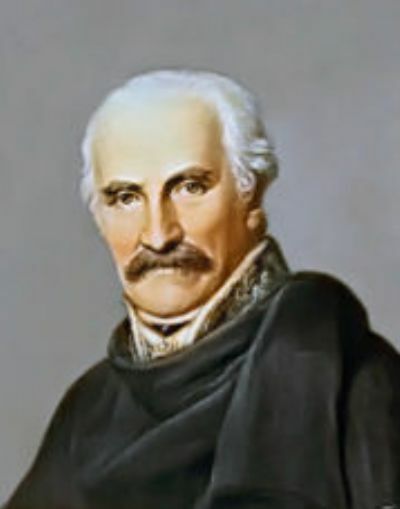 Recent historical reports have very much suggested that Ney was a burnt-out and unstable force by 1815, having been psychologically wrecked by his experiences leading the rearguard in Russia in 1812. 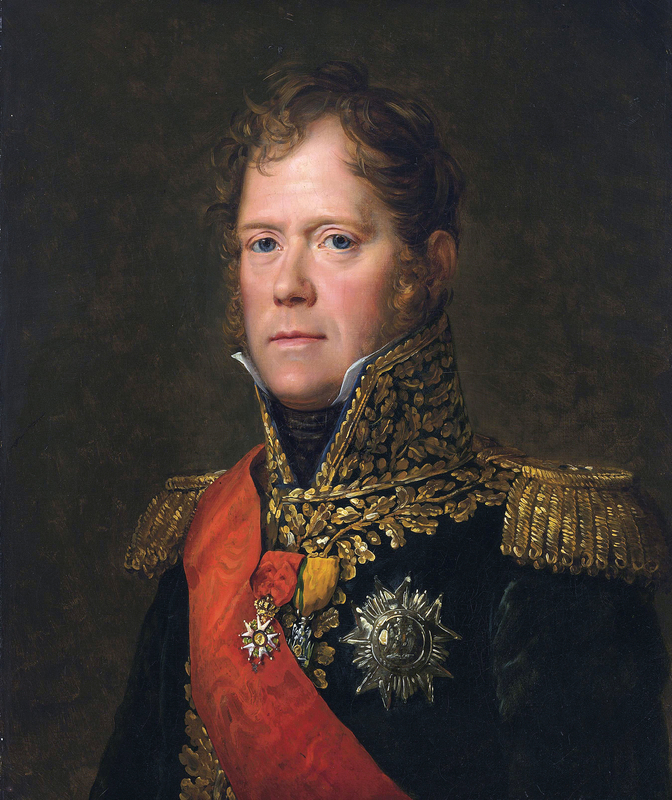 That Napoleon entrusted his left wing to him calls his judgment even further into question. Why did he do it? Was it that the ailing army coach saw the old veteran as he had once been in the glory days, and erroneously thought that all the old talent was still there? Perhaps. But Ney’s creative talents, the sort of talents this plan required, had always been suspect. Wellington had totally confounded him, and Ney had always tended to be the sort of eager subordinate one has to point at the right thing, whisper a few words of encouragement to, and then leave to take or to hold whatever needed to be taken or held onto. Interpreting a situation entirely on his own was not his strong suit, and with his temper lurching all over the place, he was never going to be the man to control and co-ordinate the subtle evolutions of a carefully arranged military plan. The campaign clock really started to run as L’Armée du Nord crossed into Belgium. Delay here would bring about several undesirable effects – the Coalition armies, now gathering intelligence as to what was transpiring, would attempt junction; the “bullseye” for Napoleon’s military wedge would grow smaller as the forces around it (the road junction of Quatre bras) grew larger; and such was the nature of Napoleon’s fine design as opposed to Nosey’s bit of harness, that once one part started to falter, the whole thing would start to fall out of synch. The first potential speed bump was the crossing of the Sambre river. The border was close by, and the nearest town, Charleroi, was occupied by advanced Prussian forces belonging to one of the Army of the Rhine’s I Corps brigades. Nevertheless, the forward French forces successfully made the crossing of the river, and pushed the Prussians back on their main forces. By the morning of June 16th, the greater part of L’Armée du Nord was over the Sambre, and this with the Coalition forces still disjointed. 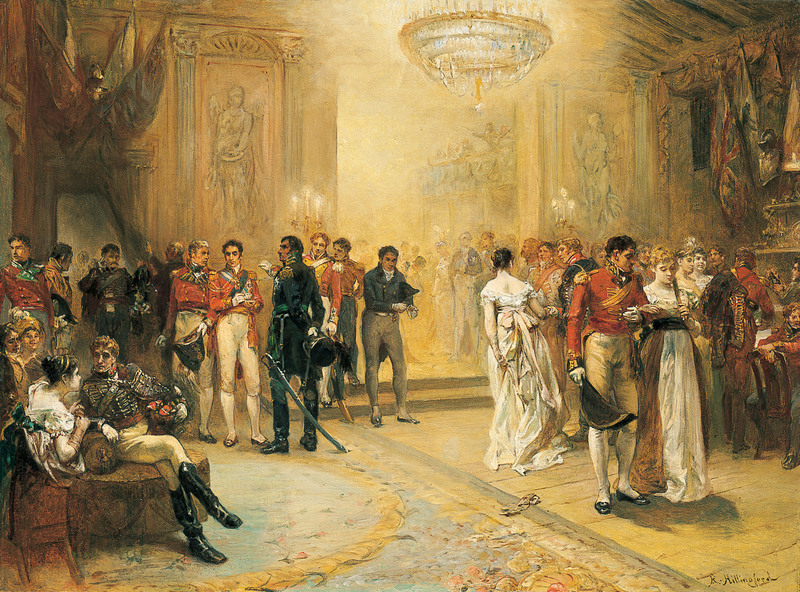 Wellington had famously heard of Napoleon’s move whilst attending the Duchess of Richmond’s ball in Brussels, and whilst he made hurried arrangements to close the gap, that the key crossroads of Quatre Bras had anything present to defend it at all was largely due to the Belgian commander on the ground acting contrary to his orders. The crossroads was vital, as French occupation of it would effectively deny any move by Wellington’s army to support Blücher if ‘Old Forwards” really stuck his neck out by going for battle immediately. Furthermore, control of the crossroads would enable the French forces present there to move, at least in part, towards the Prussians’ largely unguarded west flank and turn any bad situation for them into a total catastrophe. And this was indeed was faced the Allies that morning and early afternoon. Blücher was shaping to offer battle around the village of Ligny, just a few miles to the east of Quatre Bras, and this with just three of his four army corps – the IV Corps, under Bülow, was too far away on the 16th to intervene. Meanwhile, barely a division’s strength of Belgian and Dutch troops were present at Quatre Bras, with potentially two entire corps of French (II corps immediately threatening, and I corps also available along with strong cavalry elements) ready to bear down on them. The situation could hardly have been better for Napoleon and his plan, but from then own, and for most of the ensuing days of fighting and marching, it all went awry. 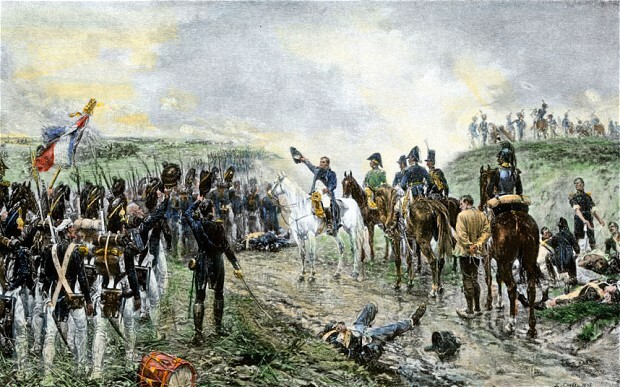 The first piece of misery leading to the first serious delay, was Ney’s prevarication in front of Quatre Bras. Later in this short campaign, at Waterloo itself, Ney would steam into anything without much more than a perfunctory look at what he was going at; but on the 16th, fearing a trap of Wellington’s fiendish design, he suspected the thin screen of Dutch and Belgian forces were a lure to something far nastier lurking behind, when it fact what he saw was all that was there. No other forces were concealed in the tall wheat or behind the hedges or beyond the gentle elevations; but by the time Ney had more or less convinced himself of that, Picton’s division was heading south on the Brussels road, with several thousand Brunswickers close behind them. 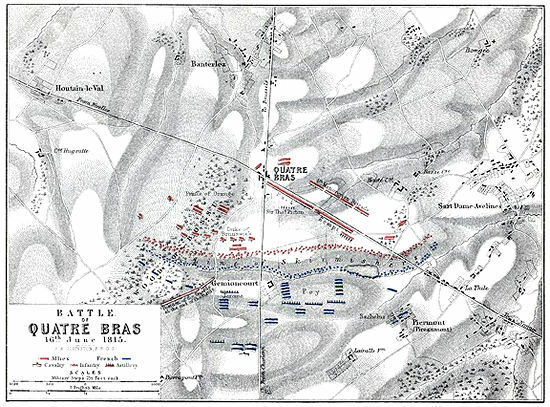 They would be arriving at Quatre Bras even as Ney was moving the II corps to the attack in the later afternoon. To the east, Napoleon’s main body, consisting of III and IV corps, the Imperial Guard and most of the reserve cavalry were moving through and around the town of Fleurus and deploying against Blücher’s rather spread out three Prussian corps. It was hardly the fastest approach to battle in Napoleon’s career – there may have been “activité” but the vitesse had largely gone off the boil. Further signaling this was the absence from the battle of the VI corps under Lobau. This was a relatively small corps, bereft of cavalry, but contained some high quality infantry regiments. It was not brought nearer the battle until the evening, by which time it really acted as nothing but a late spectator to events. 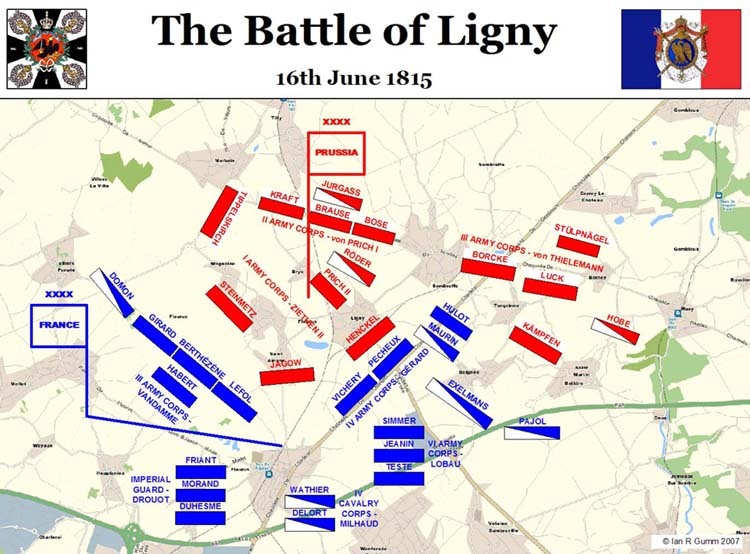 Thus, both battles began tardily, which assisted Wellington at Quatre Bras by allowing his first reinforcements to reach the field ahead of the first crisis; and at Ligny, the late start meant that the French were trying to complete their hard won victory even as it was getting dark. However, the greatest farce on the 16th lay in the performance of D’Erlon’s I Corps, who really proved to be the French equivalent of The Grand Old Duke of York. Ney wanted the corps at Quatre Bras to defeat the forces that would not have been there if he had attacked when he should have done. Napoleon wanted I Corps to perform at least a partial envelopment of the Prussians, and so degrade them past any prospect of military viability for the rest of the campaign. Of course, in an era of uncertain communications, Napoleon was assuming rather than knowing that Ney had done his job and was marching contingents to Napoleon’s assistance. What this resulted in was in both factions yanking at I Corps’ lead, with D’Erlon apparently lacking the drive to cut through the bluster and go somewhere, anywhere, of his on volition. Had D’Erlon resolved to make his own decision, and had thus intervened on either field, the result could have been decisive; but as it was, the entire corps turned this way and that, went about even as he was nearing the Ligny battlefield, and thus ended up doing nothing anywhere. Well, not exactly, not quite yet, at least not in the biblical amounts of a few hours later, but for all the positive action the French forces got up to immediately after the two battles of the 16th, it might have well rained all through that night and into the morning. Napoleon’s campaign plan really required the first defeated army to be ruthlessly chased and essentially bothered out of any lingering effectiveness by a rapid and close pursuit. But, after Ligny, no proper pursuit was organized until the following morning, and this only after the emperor had had a rest and toured the battlefield. And then, when the pursuit did begin, Marshal Grouchy, in command of 30,000 men, set off on the wrong road and spent several hours “chasing” after a phantom army of Prussian deserters fleeing to the east…whilst the Prussian army, albeit battered and bruised, was heading north towards Wavre. We may divert ourselves here by considering how the likes of Bobby Lee and Stonewall Jackson would have dealt with a battered enemy force in retreat. One can well imagine Lee suggesting to Stonewall that “it will be most beneficial to ourselves if those people are kept discomforted.” That would have surely sufficed to fill the pursued route with the further wreckage of utter defeat; but in the case of Grouchy, the trail of pursuit was not so much filled with the litter of defeat as with the discarded strawberry stalks of the Marshal’s impromptu snacking. But however we present it, the Prussians were left to recover, to the extent that the IV corps of their army was able to join with the other three. As for events at Quatre Bras, as far as Ney was concerned, there were not any events at Quatre Bras…leastways none he could see. In truth this was quite amazing, as large numbers of Wellington’s troops were presently clearing off to the north whilst the French were still at breakfast. Suddenly apprehensive as to why he was hearing nothing from Ney, Napoleon then finally bestirred himself and hastened over to Quatre Bras where breakfast was still going on. 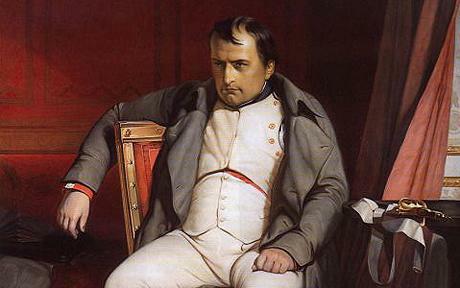 It is probably safe to say that the emperor did not help himself to a croissant, as he raged before Ney “On a perdu la France!” Indeed, the implications of Ney’s inactivity were rather obvious, and if Ney had possessed any sort of rudimentary notion or faculty to do more with the imperial plan than play finders keepers with the I Corps, he might have noticed that Wellington’s army was disappearing before his eyes, and that the imperative pursuit was far too late beginning. Had Davout been there, instead of being stuck in Paris “organizing things,” there would have been a very good chance that Wellington army would have been fixed in place by deliberate attacks that morning, leaving it in a desperately vulnerable position as the French forces from Ligny closed in. But, despite one moment of crisis at Genappe as Napoleon tried to get some sort of pursuit going, Wellington’s army was able to get back to the pre-selected position just south of Mont St Jean, helped by the massive and enduring downpour which then occurred. Of course, Napoleon’s plan could hardly have been predicated on “Well what do we do if it rains?” but the truth is there was plenty that could have been done before it got seriously wet – only next to nothing was done. When we turn to events on the 18th, the long enduring question has always been: “Could Napoleon have begun the battle of Waterloo earlier?” Despite what you may read somewhere, or seek to set up in a game, the simple truth is that very little could have been started at Waterloo before its historical start time of approaching noon. The French army was simply too strung out after trying to march through that appalling storm, and the ground was impossibly wet. Yes, Napoleon did therefore lose as much as five hours of battle time waiting for the ground to dry and his army to complete its deployment, but this would not have mattered nearly so much if Grouchy’s pursuit of the Prussians had been early and effective, and if Ney had done something other on the morning of the 17th save wait for his coffee to turn up. 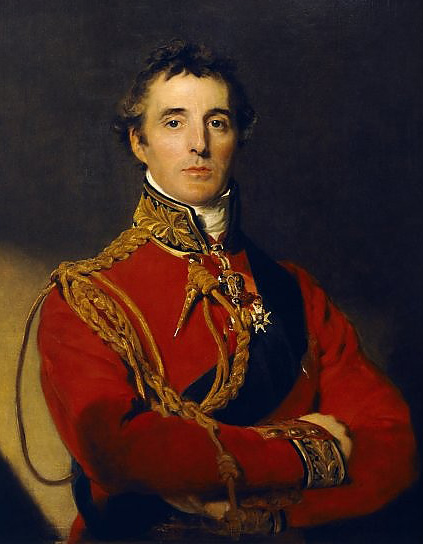 As it was, despite incorrectly assessing Wellington’s army as stronger than his, Napoleon that morning of the 18th put his chances as ninety in his favour to ten against, and curtly dismissed any notion that the Prussians might be able to assist Wellington by the convenience of considering them more damaged and demoralized than they actually were. One thing totally missing from his calculations in this regard was just how much hatred Blücher had for Napoleon, and thus while he still had an army of any description, the old Prussian was forever set to go after his despised enemy. So time went by again whilst the ground dried sufficiently for the French to move their cannon; and perhaps having some stabs of doubt as to what was happening to the east, Napoleon sent a message to Grouchy advising him of the rumours of the actual Prussian movements, together with a suggestion that Grouchy shift over to the west. Of course, by now Grouchy was miles away from the main Prussian force, and really needed a direct order telling him to move his army and his strawberries directly to the emperor’s assistance. Napoleon would eventually issue something like this order, but far too late in the day for it to have any effect – three Prussian corps were to arrive at Waterloo, leaving the III Corps to hold off Grouchy at Wavre when he eventually turned up. What occurred at Waterloo rightly now belongs to the ages. It has been described countless times, and I will not seek to add a further account to the long list. Instead, for me the most significant aspect of that final battle is that it saw the Iron Duke at the peak of his powers, doing what English warlords have always tended to do best – make a stand on a hill and defy heaven and earth to move them off it. For Napoleon, for any one of a number of reasons, it was simply one battle too many. After Ligny, some generals had observed that the Napoleon they had known did not exist any more, and certainly there was nothing about his conduct at Waterloo which would have reminded one of the victor of Marengo, Austerlitz or Jena. It was as if at some fundamental level he just could not be bothered with all the taxing necessities of battle. He left much of the battle to Ney, and Ney made a complete mess of nearly everything. Apart from formulating the initial plan, Napoleon appears to have done precious little that day until near the very end. Then, with all his time close to being entirely used up, near his last action was to lie to his own men by telling them Grouchy was on the field, and then to lead the final attack of the Guard to within six hundred yards of Wellington’s line before pulling away and watching the subsequent calamity unfold. Napoleon is supposed to have once said “we only have a certain time for war.” By 1815, it is clear he was on borrowed time, and what was left to him in life and in fortune was of very poor quality. His 1815 plan needed the sort of qualities Lee and Jackson brought to Chancellorsville forty eight years later; in other words, not a mentally broken down subordinate acting haphazardly on the orders of a commander whose triumphs were now all in his mind. Posted in Waterloo Games and tagged 1815, Blucher, Ligny, Napoleon, Quatre Bras, Waterloo, Wellington. Bookmark the permalink. I enjoyed reading your article. The time analogy is certainly very appropriate to Napoleon’s situation in 1815. Thank you for posting!